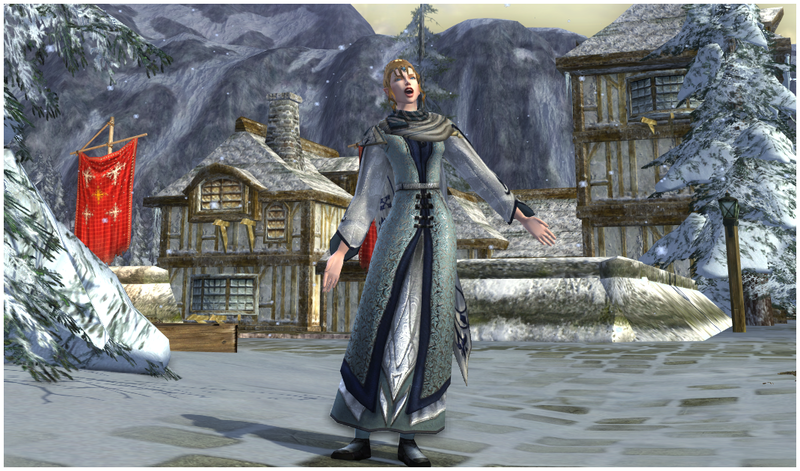 It's hard to believe another year has come and gone in LOTRO. And it's even more difficult to believe that I actually have a chance to upload some Yule outfits, let alone have a PC to upload them with (last year, I didn't have a working one)! I'll be keeping this post rather brief. As I'm finalizing this entry, and scheduling to auto-post while I'm working Saturday morning, I have a batch of mini oreo cheesecakes chilling in the fridge. Soon they'll be done, and then it's back to the kitchen for more baking! This will be my only chance to squeeze in some LOTRO time until after Christmas. 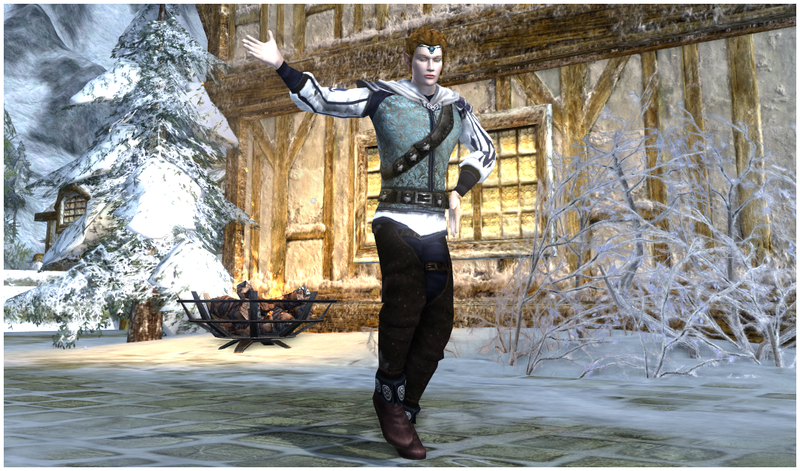 I also had the opportunity this to run through the Yule Festival for the first time this year. I've missed it dearly. It's my favorite festival! I had enough tokens saved from two years ago to barter for all the rewards from this year and the previous one. 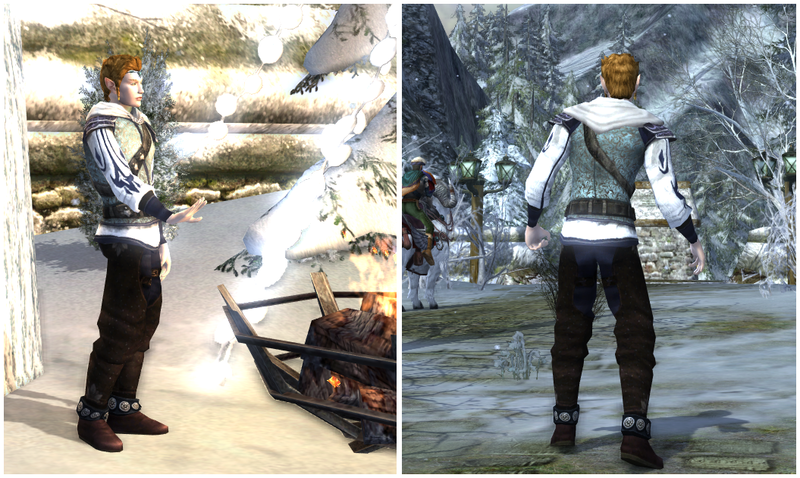 The Winter's Light robe and cloaks looked beautiful, but I'm not sure what to do with them. 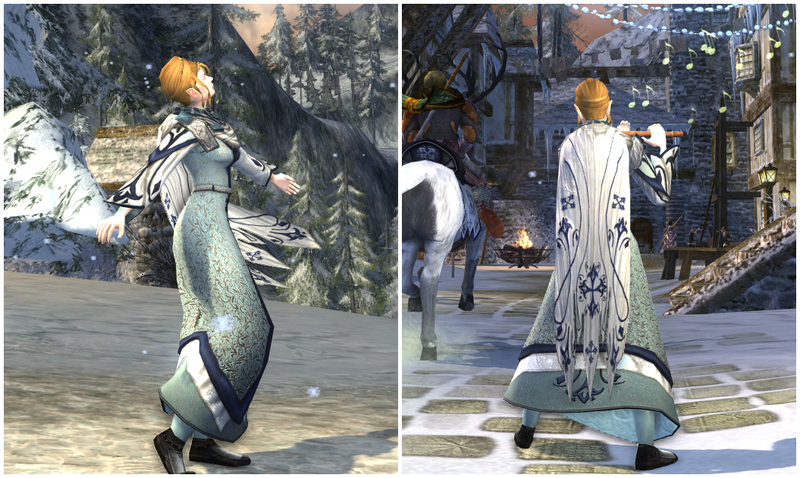 However, the new Ornate Winter sets are drop dead gorgeous! It didn't take long to create some simple and lovely outfits for them. From what I've seen, they dye lovely shades using blues, purples, black, and, of course, their default white. I couldn't decide which outfit to post (I was originally intending to have only one), so I decided I should post both in a "His & Hers" style. I may have to use this theme more often! Happy Holidays from Material Middle-earth! ...and in case I'm not back yet, a Very Happy New Year too! **Even though this can be bartered for during the Summer Fesitval or won from a Cosmetic Gift Box from the Anniversary Festival, only the LOTRO Store version is dyeable. However, the default turquoise color comes very close to belegaer blue. Belegaer blue best blue :D Merry Holidays and a Happy New Year Nathrien! And there couldn't have been a better blue for these either! Happy Holidays and Happy New Year, Gloredh!